The closed cavities of the body—namely, the pleural, pericardial, and peritoneal cavities—are each lined by two membranes, visceral membrane and parietal membrane. There is a small amount of fluid between the membranes that is an ultrafiltrate of plasma. 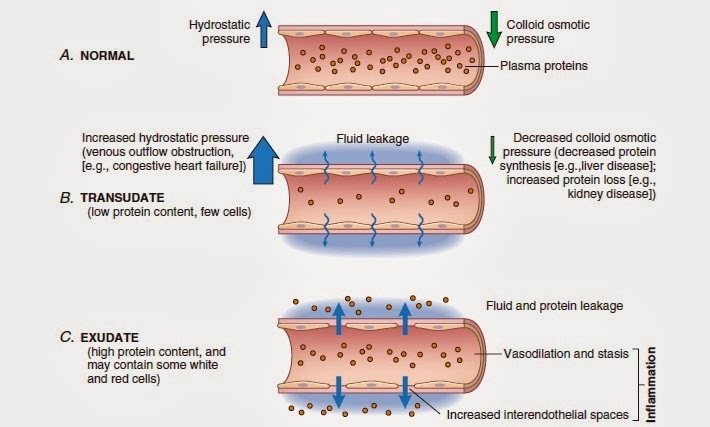 When the production and reabsorption of the ultrafiltrate is not balanced, fluid may accumulate, resulting in effusion. Effusions may be classified as transudate or exudate. Cause Usually develop from imbalances in hydrostatic and oncotic forces in circulation. Usually develop from increased capillary permeability or decreased lymphatic reabsorption. Thanks for the information that you avail to us. © 2019 LaboratoryInfo.com. All Rights Reserved.